Composed of an exclusive blend of 100% vegetable protein sources and enriched with 12 essential vitamins, this supplement is perfect for vegetarians and vegans. Stay healthy! Vegetable protein, complete amino acid profile, delicious taste. 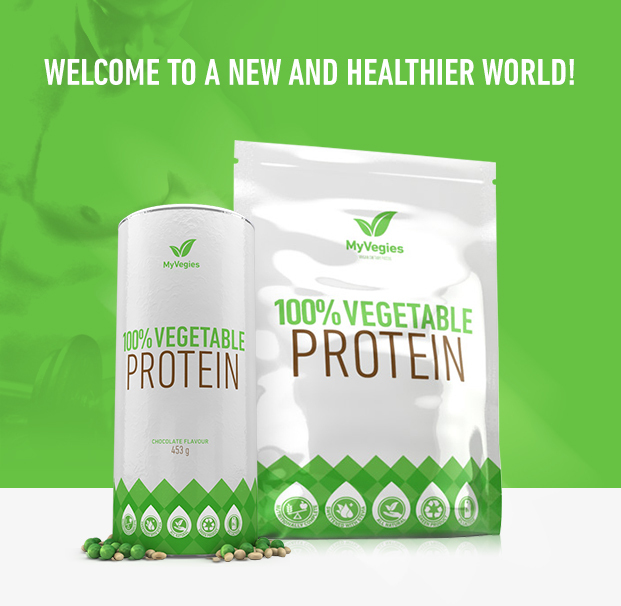 If you are a vegetarian, vegan, or if you simply avoid including meat in your diet, there is a question you are probably bombarded with all the time: “Where do you get your protein?” MyVegies developed 100% Vegetable Protein to become the supplement that will cover all your protein needs. 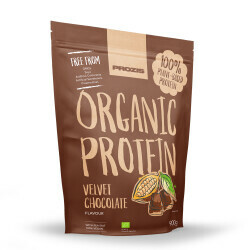 Whether you are an athlete with specific protein requirements, follow a vegetarian or vegan diet, or simply want to cut back on animal products, 100% Vegetable Protein is the healthy, delicious and complete protein supplement you need. Some people are just obsessed with protein. Vegetarians and vegans are constantly asked about their protein intake by people who share the misconception that one must consume large amounts of animal protein daily to stay healthy. Many athletes foster the habit of consuming large portions of red meat before competing, thinking this will improve their performance, and protein supplements that are sold at health food stores. This idea about protein is misplaced. Yes, protein is certainly an essential nutrient, that plays a myriad of roles in the way our body functions. People need significant amounts of protein daily to ensure normal repair and growth of body tissue, to maintain the structure of red blood cells, and to ensure proper functioning of the immune system, among other functions. However, we do not need the exaggerated daily amount of animal protein most supplement brands suggest we do. For a normal adult of average height and weight, the RDA recommends 0.8 grams of protein per kilogram of body weight. For most people, that would mean no more than 65 grams of protein daily, a blatant contrast with the 200+ grams of protein many athletes and even people with a sedentary lifestyle tend to consume. This massive amount of animal protein is not only unnecessary – as we now know – but it can also be dangerous. Diets that are extremely high in protein are known to cause several gastrointestinal conditions, they can lead to liver and kidney problems, and have even been associated to several types of cancer. People with a vegetarian or vegan diet do not share any of these concerns. They meet their daily protein requirements with vegetable protein, obtained from many types of foods, from soy and cereals to nuts and beans, and they manage to avoid the illnesses linked to animal protein consumption. Yes, vegetarians and vegans are perfectly capable of obtaining enough protein from their diet, and they manage to do so while preserving their health too. If vegans and vegetarians get enough protein from their diet, should they use supplements too? Of course they should! If meat eaters supplement themselves with protein, then vegetarians certainly can – and should! - do the same. Although a vegan or vegetarian diet may provide enough protein to meet most people's basic daily requirements, fact remains that meals must be well thought out to ensure you get enough protein. And while it is possible to carefully plan ahead and have several dishes ready to go, to pack and take to the office or for a quick late-night dinner, you will still have to prepare these meals in advance, which means shopping for groceries, cooking, and cleaning up in the end. And let's not forget about the calories either, because even though you may have a nutrient-rich diet, that doesn't mean it's lean. Most people tend to associate a vegetarian diet with getting healthy and lean, but that's not necessarily so. Vegetarian diets may be healthier in the sense that the sheer amount of vegetables in most dishes comes with loads of vitamins, minerals and fibre that you wouldn't get in most conventional meals. In terms of calories however, a vegetable stir-fry or stew, for example, may pack as many calories as your typical fast food meal. Finally, vegetarian and vegan athletes need to consume larger amounts of protein to keep their muscles strong and healthy, and supplementation can provide a quick, complete and powerful vegetable protein solution. This is when vegetable protein supplements come in handy, and that is why MyVegies created 100% Vegetable Protein. 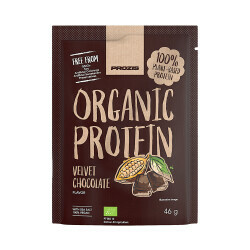 In case you don't have the time, interest, or skill to prepare a complete vegetarian meal, if you need a convenient protein product you can easily carry anywhere, or if you simply want to add extra protein to your diet in a practical and effortless way, 100% Vegetable Protein is the perfect solution. Composed of an exclusive blend of vegetable protein sources, 100% Vegetable Protein provides a complete and highly bioavailable protein with all the essential and non-essential amino acids one needs to stay fit and healthy. MyVegies also enriched 100% Vegetable Protein with several important vitamins that will support your body functions and give you extra energy. Wheat Protein, L-Glycine, Soya Protein Isolate, Pea Protein Isolate, Cocoa powder, Flavorings, Vitamin (L-Ascorbic Acid, DL-Alpha-Tocopheryl Acetate, Nicotinamide, Retinyl Acetate, Calcium D-Pantothenate, Cholecalciferol, Pyridoxine Hydrochloride, Thiamine Hydrochloride, Riboflavin, Pteroylmonoglutamic Acid, D-Biotin, Cyanocobalamin), Emulsifier (Creamer), Thickeners (Guar Gum, Xanthan Gum), Sweeteners (Steviol Glycosides, Sucralose) . Recommended Daily Portion: Take 1 serving daily. Instructions: To make one serving, mix 1 sachet (30g) with 300-350mL of cold water or any beverage you prefer. If you desire, add your favourite fruit and blend to make a delicious smoothie. Contains wheat and soy. May contain traces of milk and egg. With sweeteners. Do not exceed the Recommended Daily Portion. This product should not replace a varied and balanced diet and a healthy lifestyle. Keep out of reach of children. Suitable for vegetarians. 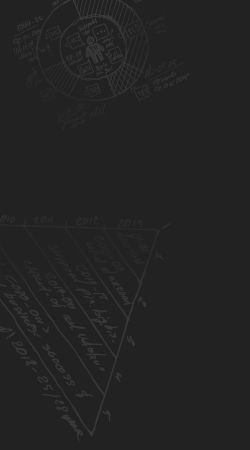 Keep in the original packaging in a cool, dry place, away from direct sunlight.